Michele Amitrani is the author of Omnilogos which Angel had the privilege of reading and reviewing. 1. How did you come up with this plot? I was lucky enough to see the Space Shuttle Atlantis departing from Cape Canaveral in 2011. It was a really inspiring moment for me, in a way I can hardly describe with words. I have always been interested in space exploration and in everything NASA-related, so to actually be there and see the Atlantis’ rockets ignite, while hundreds of people around me were cheering and smiling, was quite an experience for me. When I came back home that very day, something else ignited in my mind. It was an image, more specifically the image of a kid sitting on his father’s shoulders while pointing at the firing rockets of the Atlantis. That image was so vivid I could not stop thinking at it and after a while I decided to write it down in order to keep it as sharp and as real as possible. When I finished writing, I read those few paragraphs with a mixture of interest and wonder. 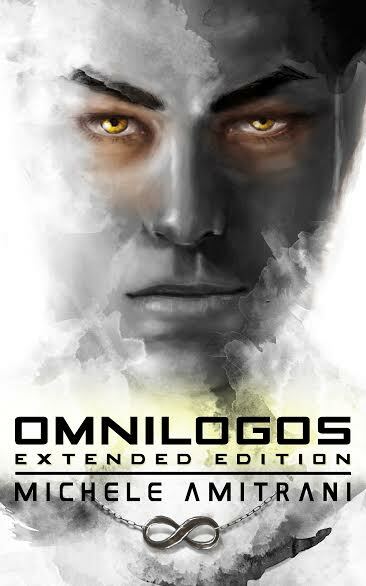 At that time, I really had no idea I was actually writing the first chapter of Omnilogos. How did I came up with the rest of the plot is more difficult to answer, but basically it involved lots of reading, researches and asking myself questions I had no answers for. I wrote the book in Italian first (I was born and raised in Italy, English is just my second language). It took me around three years and a half to finish writing it. I then decided to translate it into English by myself and to have it revised by several beta readers and proofreaders, a process that took another full year. I’m aware my English is quite poor compared to a native English speaker, so I figured that I needed other people with a deeper knowledge of the language to refine and polish the manuscript. After a few researches on the Internet, I was able to find several proofreaders that dramatically improved my translation. To be honest with you, I still have no idea how I managed to do all of that by myself and deliver to my English audience a final product that is enjoyable. To think that I will probably have to do something similar with Pelargonium, the sequel to Omnilogos, terrifies me. Pelargonium is three times bigger than Omnilogos! 3. How did you make the Omnilogos' ambitions so real? I always liked very smart, knowledgeable and ambitious people, who at the same time need to struggle with their own fears to achieve their goals. I think this combination makes people more real and vivid in our mind. I have to admit that the Omnilogos’ ambitions (his desire to ‘elevate’ humankind and to achieve the ‘status of spacefaring civilization’) are in part my own. I strongly believe that space exploration is something we need to do as a species in order to survive and to evolve. I guess this consideration answer in part to your question. The Omnilogos’ ambitions are my own, and therefore this passion of mine translated in Wei being a more motivated character. I’ve always problems answering this question! I guess the reason is because people expect a straight answer, in this case, to name just one character. But that is something I have never been able to do. All the characters I create are my favorite in different ways. I love Evangeline’s way of seeing the world and I’m fascinated by her unique personality that enables her to ‘unlock’ Wei’s potential. I admire Tiago’s stubbornness and curiosity, I fell compelled by Spine’s humor and ideals, I greatly respect Cantara’s pride and resolution, I envy Gladia’s courage and ingenuity and feel quite proud to have created a character like Avalon, who is both intriguing and disgusting. Wei is a collections of shades, a character very difficult to figure out and probably the most controversial in the book. We really don’t know a lot about him, but we understand his goals by the way he interacts with other characters. 5. How many books will be in this series? The Omnilogos Series is composed by four books. I like to think at Omnilogos as a prologue of a trilogy (in a way, it is very similar to what ‘The Hobbit’ has been for the ‘Lord of the Rings’ trilogy). I published Pelargonium (Italian Edition), the second book of the Omnilogos Series, just a few weeks ago and I’ll start working on the third book this February. 6. Where did you get the ideas for the storyline in this book? I always try to read a lot when I know I have an idea for a book but I’m not quite sure where this idea might lead me. For Omnilogos I mostly read essays and articles and watched lots of documentaries to help me figure out the technical parts. I try to be ‘scientifically sound’, so to speak, when I write a Science Fiction book. Many of my ideas comes while reading, or researching, but mostly when I’m actually writing. For example, I had no idea what kind of character Avalon would be before actually writing his chapter. This ‘create as you go’ kind of approach is something I’ve used also in Pelargonium, and it has produced another character that is now considered to be one of the most interesting in the second book. 7. Why did you become a writer? I love creating worlds I can populate with believable characters moved by different goals. It is an exercise my mind always liked to do. I think this is nothing special, really. Everyone is a storyteller in her own right, but the reason why I became a writer is because I wanted to show my creations to other people, and see their reactions to them. If my stories were interesting, if they elicited questions, if they were judged compelling or thought provoking, than I was satisfied. Even when they are not, I try to understand what went wrong in order to improve my skills. I am a writer because I love telling stories that will survive me when I’ll not be around anymore. It is a sort of legacy I leave behind. 8. What are your favorite books? Authors? I’m reading these days a huge fantasy saga by Robert Jordan. It’s called ‘The Wheel of Time’, and I have to say that so far it’s one of the best book series I’ve ever read. It is easily becoming one of my favorite series. It’s engaging, incredibly well written, full of plot twists and the characters are so believable and fascinating I’d like to live in their world. I also love other fantasy series: A Song of Ice and Fire by George R.R. Martin, The Lord of the Rings by J.R.R. Tolkien, Harry Potter by J.K. Rowling and many more. On the Sci-Fi side I could name a dozen different authors, but I’ll just say that Isaac Asimov and Sir Arthur Clarke are on the top spot. I also like reading manga (Japanese comics) and Neon Genesis Evangelion, Trigun and Berserk definitely shaped my way of writing and crafting stories. 9. What do you think about our blog? I’m always incredibly grateful to blogs like yours that gives authors a place where to answer questions and engage with the community. I also treasure the time you take to review and promote books that you deem worthy to be noticed. Self published author like myself can never thank enough a website like this to get the word out and promote their efforts. 10. Is anything in your book relatable to you somehow? My books are me and I’m my books. When I publish a book, it’s like I’m putting out there a piece of myself, so in a way, it is always a personal experience. I guess the answer to your question is: everything in my books is relatable to me. 11. Have you written any other books? Except for Omnilogos and Pelargonium, I wrote a Political Science essay (in Italian) about the People Republic of China, a short Sci-Fi story called “When Gold was Black” and a Self-Help book about my experience as a self published author. 12. Any other interesting facts/info you would like to share? We are so glad that you chose to publish your book. It has been one of my favorite books so far! I want to thank you for your time and support of us and I can't wait to read and review the next book(s) in the series!